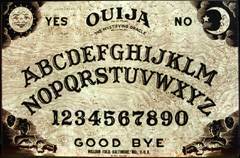 This Ouija design was first introduced in 1955 by William Fuld. This is the last of the large and heavy hardboard Mystifying Oracles. It measured fifteen by twenty two inches, was a quarter of an inch thick, and weighed nearly two and one-half pounds. The sun , moon and seance design is identical to today’s Parker Brothers Ouija. Depending on what you wanted to spend, you could have the paper covered hardboard model or the more expensive all wood bird’s eye maple deluxe Mystifying Oracle. Although not the inventor, William Fuld manufactured Ouija Boards for decades and the boards and planchettes (the pointer thingee) often bore his name. Parker Brothers bought the rights from the Fuld family in 1966 and hold all copyrights today. In early 1999, Parker Brothers stopped manufacturing the classic Fuld Ouija board and switched to a smaller less detailed glow in the dark version.